Two guys head south of the border, one riding a Yamaha XT225. At this writing they have travelled from Colorado across the Southwest USA, Baja, and mainland Mexico. An American hopscotches across Southeast Asia, renting small displacement Hondas in the countries he visits. Then he flies to China, buys a 250cc Shineray, and continues his journey. A 70 year old woman ships her Honda CRF250 to Colombia by sea, flies down, and rides solo to southern Chile over a four month period. After Chile, she flies to Houston with the motorcycle in the aircraft's cargo hold, and proceeds to ride 1000 miles home to Wisconsin. Illustrated with many photos. Steph Jeavons on a long RTW with a 250L. Just starting her way up Africa. And of course Lois Pryce on her Serow and TT250 - 3rd book recently out on Iran. I think I've just got them out of my system. On getting back I couldn't resist a smashed up XSR700 (180kg) with a nice low seat to hopefully scramblerise into a Yamaha 'Desert Sled' ahead of the anticipated T7 which will probably weigh more. I've always preferred light bikes and unlike a car, lightness is key. For me the ideal travel bike clocks in at 200kg or 450lb, loaded. These days ~700cc is more than enough enough to get the job done, but until you get out into the Overland Zone (where most bikes are <250cc), I find the comfort and road speed of a 250 can leave you a bit vulnerable at times, with a load and at my weight (210). Certainly, I feel anything less than a 250 puts you too low in the food chain once carrying an overland load, but on trip longer than any I've done, acclimatisation to a bike's compromises can wind you over. For me the great benefit is that no normal off-road situation presents an intimidating challenge, as it would on heavier machines, especially as I'm not 18 anymore. I spread this message everywhere I post ;-) What is needed is a modern electric XR400 or similar. A bit more poke for not much more weight. Jap reliability. The ≥ 250s announced in the UK end of last year: KLX300; 250 Rally; 250 V-Strom; GS310 – were all disappointingly heavy. Chinese-engined bikes may fill that niche first. The unique CCM GP450 has been discontinued. I live right at the start of the Carretera Austral in southern Chile and I am amazed at how many folks are riding smaller bikes. They are very common here in Chile and lots of foreigners come and ride all over Chile and tour Patagonia. Its impressive. I have been able to ride a lot of smaller bikes recently and its so much fun. You can go a lot of places on a small bike, and are less intrusive into small remote town. Good times. Here is a fellow from Rhode Island who travels with his wife on a pair of Yamaha TW200s. In this thread they ship the bikes to Tucson, and travel around the southwest USA. Yamaha has made the TW200 for many years. Used examples are inexpensive. So this couple's plan is to buy used, outfit the bikes for touring, ship them to an interesting location, ride around, and then stash the bikes for a return visit. 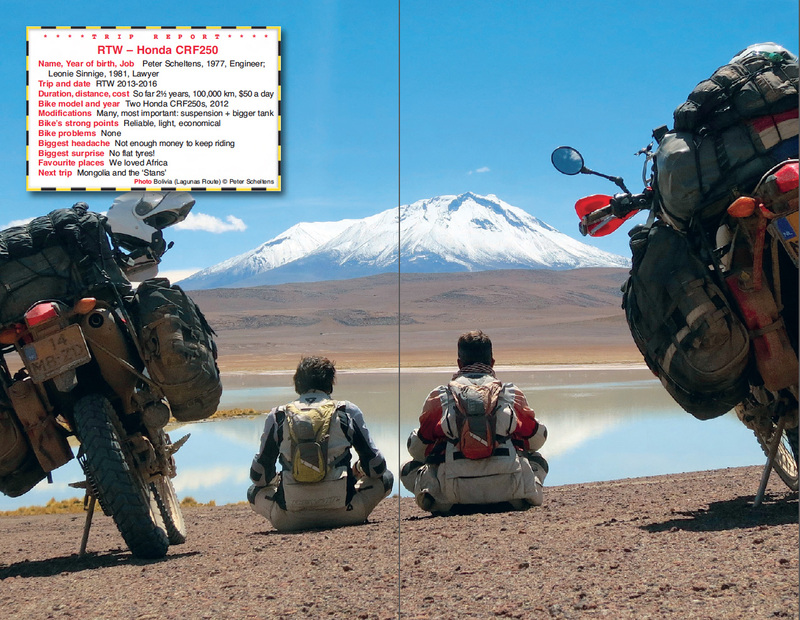 Here's a New Zealander who is riding a KTM 500exc north from Chile to USA. He's in Moab right now. Good example of adapting a dual sport model for touring. 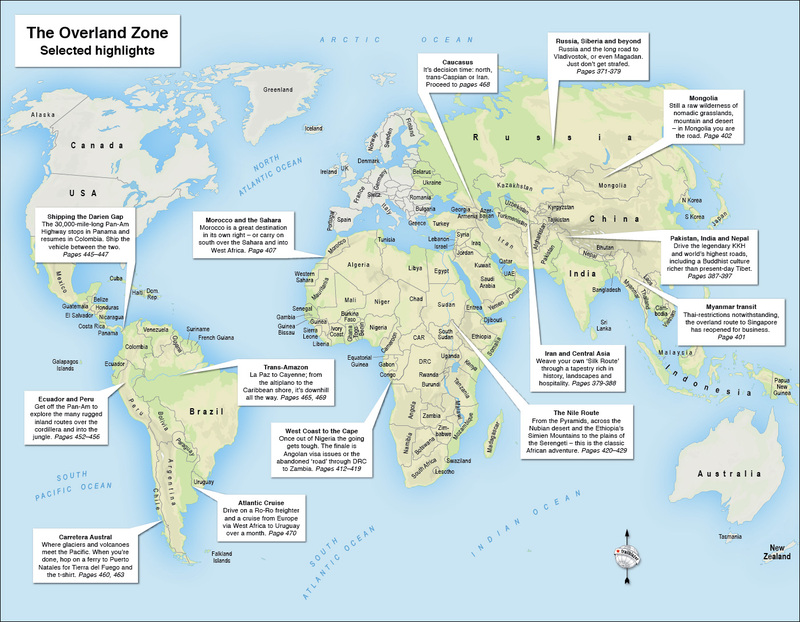 A woman buys a Kawasaki 250 TR in England, and rides home to Iceland by taking ferries first from Denmark to the Faroe Islands, and then on to Iceland. Distance traveled is about 1000 miles by land, 1200 miles by sea. The 250TR is a modern version of the basic air cooled single cylinder Japanese street motorcycle, sold around the world since the 1960s. The 250TR was not imported to USA. A similar model that is imported here is the Suzuki TU250X. Thanks to an article in RideApart.com, I learned about Anita Yousof, the first Muslim woman to ride a motorcycle around the world. Anita rode a Yamaha FZ150 on this journey. Now that she is back home in Malaysia, she continues to ride this bike. Anita was an experienced solo adventure traveler before her RTW ride. Her blog page lists trips in many parts of Asia. Two blokes from New Zealand are traveling the Trans America Trail on Honda Grom 125 cc machines. Presently they are in Arkansas. A good read. Two travelers fly to Ecuador, rent Yamaha XT250s from Ecuador Freedom Bike Rental, and ride across the Andes. Shinji Kazama has lived a life of motorcycle adventure. Now in his late 60s, Kazama was most active in the 1980s and 1990s, when he rode his motorcycle to the North and South poles, on Mt Everest, and to the summits of Kilimanjaro and Mt Fuji. Kazama rode small displacement Yamaha and Honda machines on many of his adventures. 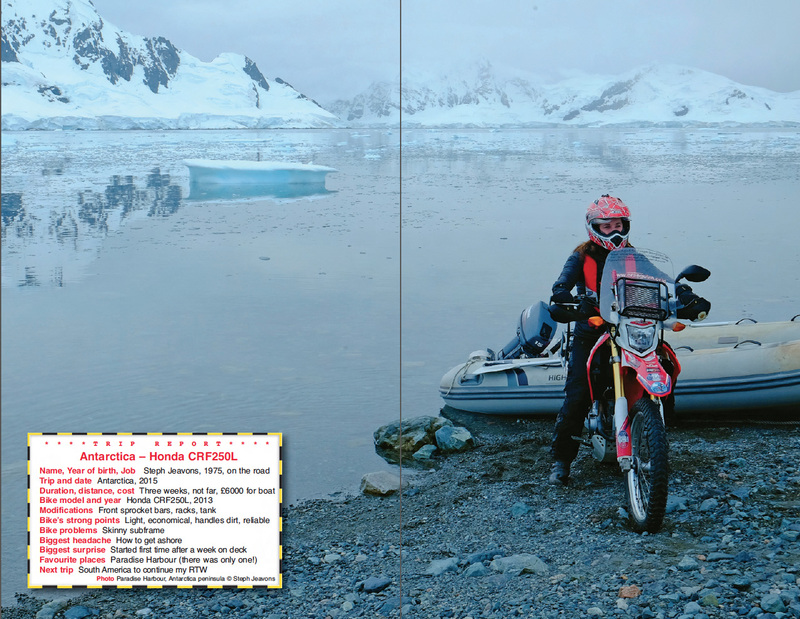 Here’s a rememberance of his two rides in Antarctica. On the first, he rode a Yamaha TW200, modified to use a 250cc air cooled two stroke engine. The second ride employed a liquid-cooled two stroke Yamaha YZ250 (I believe this is correct). Interesting that you can still purchase versions of these two machines from Yamaha today. Kazama was badly injured in an accident while competing on a motorcycle in the Dakar Rally in 2004. He recovered, and undertook a 52 day, 18000 km / 11000 mile ride from Vladivostok to Portugal on a Yamaha Majesty 250, a type of scooter. These days, Kazama uses four wheels rather than two for his adventures.